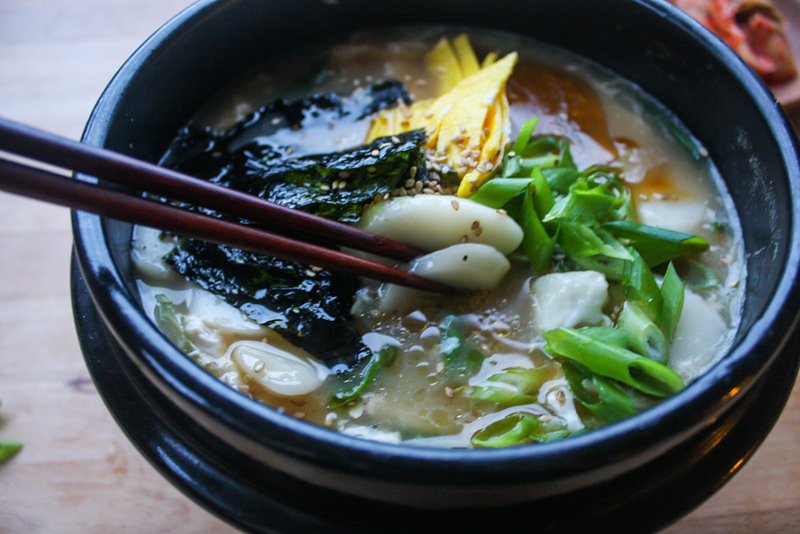 For a dish with magical properties, it's one of the simpler Korean dishes to make once you have all of the ingredients. Of course, this is wonderful with kimchi. The more sour the better I say. And if you happen to win the lotto because of this recipe, I totally have no problem going halfsies with you on the winnings. Rough chop 2 green onions and put the white bottom half into a soup pot with the grated garlic, dried shiitake mushrooms, soy sauce, salt and pepper. Add water and bring to a low boil for about 25-30 minutes, stirring occasionally. Separate the eggs and whisk the yolks. In a medium heat pan, fry the eggs yolks in one flat circle. 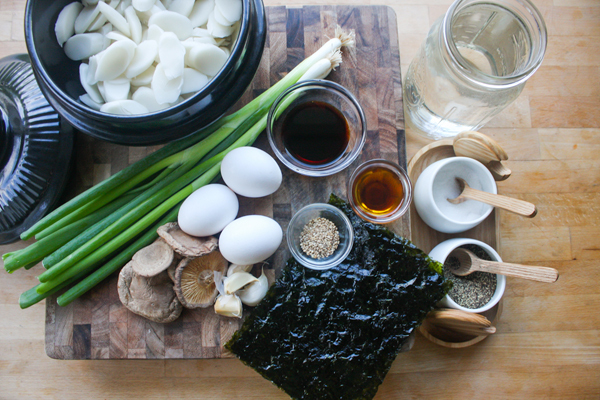 Prep the rest of the toppings by cutting the roasted seaweed into strips, rough chopping 1 green onion into small pieces and cutting the fried egg yolk into strips. 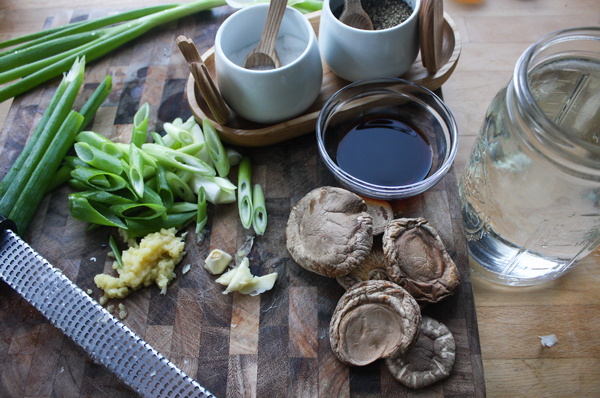 Discard the mushrooms from the broth and add the rinsed rice cakes and the green top part of the green onions. Stir and continue boiling for about 5 minutes. The rice cakes should be floating. 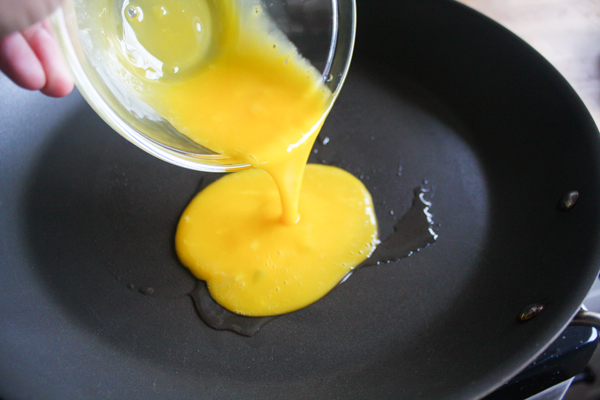 Turn off the heat and immediately add the egg white, stirring only once to get larger egg pieces. To serve, drizzle the sesame seed oil on top, pile the fried egg yolks, roasted seaweed and green onions in the middle, then sprinkle sesame seeds on top. Serve right away. 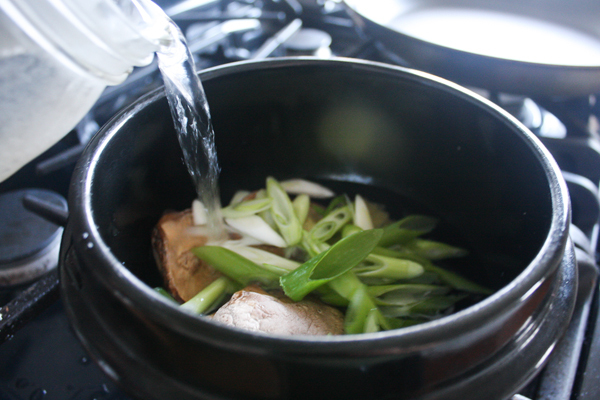 - Perfectly fine to eat the mushrooms that have been boiling in the broth, we just don't in my home as a preference. - Substitute the mushrooms for a small piece of beef brisket if you don't want this vegetarian.